Updated Documentation and Success Writing Assistance, Inc.
As much as we’d like to believe that updating documentation is critical, the plain truth is that this is probably generally the case. 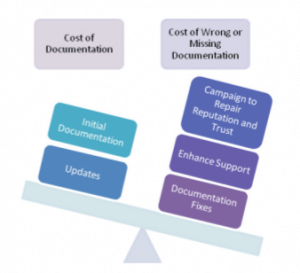 Updating (maintaining) documentation depends upon the complexity and critical nature of the product or service. Where there is a negligible opportunity to cause something catastrophic in a product or service, then updating becomes a secondary issue? Most software products are not going to cause much of a headache if the instructions are wrong though there are obvious exceptions. As a rule, yes, update your documentation – it simply is sensible to do so. The example of IKEA? Well, we’ve pretty well all been there by now, and for most of us, one of the first things we do after scanning the instructions is to throw them away. Of course you can’t do that if you are operating a nuclear reactor or financial software package etc but perhaps software products at least, need to have a certain redundancy safety built into them? Brand identification as far as I am aware, suffers little from the vagaries of poor documentation. Indeed, throw a brick in the direction of any of the TV/video products manufacturers and the handbooks all suffer from the same abysmal verbiage. We simply learn to live with it. Hardware product are more difficult though, as real damage can be done if the wrong procedure is followed. And certain software systems can royally screw-up your customer base if they are not programmed properly. But by and large most people (I believe) don’t have the time or inclination to read and why should they? Is it not about time that more thought was put into the use of the product than the 10 volumes of condensed text that goes with them? So why don’t we start from that premise and make the software or product do the talking for us?